Pros: *drool* uh, I mean, fantastic results! Cons: Try not to go into diabetic shock, okay? Review book (published 2010) provided courtesy of Chronicle Books. Cake, frosting, chocolate… ohhh my. I knew I was in trouble as soon as I laid eyes on Elinor Klivans’s Chocolate Cakes: 50 Great Cakes for Every Occasion . As is de rigeur for most Chronicle cookbooks, the following is true: There are plenty of gorgeous photos, although not of every recipe. The table of contents includes the recipe titles so you can find what you want at a moment’s notice. There’s a simple but useful index. The pages are glossy and will stand up to a fair amount of use. The pages lie surprisingly flat, and the layout of the recipes is clean, clear, and easy to read. Now that that’s out of the way, I can get to what’s important: the cakes! There’s a wonderfully brief-yet-informative section at the beginning to explain such things as cocoa vs. Dutch-process cocoa, making chocolate lace and other decorative shapes, the choosing and use of various ingredients, different methods for mixing cakes (anyone familiar with cake-baking knows that the mixing is one of the major keys to success), storage of cakes, etc. Next there’s a chapter of “quick-start” recipes: a simple set of two chocolate frosting recipes (a buttercream and a ganache) and two cake recipes (devil’s food and white chocolate). These recipes are used over and over throughout the rest of the book as components in more complex recipes. A chapter of “chocolate cakes for a quick chocolate fix” delivers the goods to fix your chocolate craving—fast! I bet you haven’t had a pudding cake in forever (I don’t think I’d made one in over 15 years until the hot chocolate pudding cake in here—delicious!). I still want to get around to making the peppermint patty cake, but at least we got to the s’mores cake. I’m a s’mores fiend, but I have to admit, I’d probably reduce the chocolate in this recipe a little—it was a tad overwhelming for my tastes. Of course I’m getting old and less physically tolerant of such indulgences, so your mileage may vary! There’s something way cool about making a cake using graham cracker crumbs in place of most of the flour. Whether you prefer marzipan, mint, plain chocolate, milk chocolate, raspberries, or coconut, you’ll find something in this chapter to satisfy your immediate need. A chapter of “big one-layer chocolate cakes” would provide the perfect recipes to bring in for office parties or in-class birthdays! Although on the other hand, maybe you don’t want to waste a raspberry and white chocolate truffle cake on your co-workers. Other cake flavors in this chapter include espresso, peanut butter mousse, five-spice powder (! ), hazelnut, banana and butterscotch, whiskey, apricot and toffee, pear, and brandy with figs. Yes, there are still some simple, plain choices for folks who want their chocolate straight-up: chocolate-swirl chocolate pound cake comes to mind. “Chocolate layer cakes” again ranges from unusual modern flavor combinations (salted caramel and pecan chocolate cake) to the more traditional (chocolate ganache cake). Personally, I still desperately want to make the deep-dish white chocolate peaches-and-cream cake. Finally, a chapter of “party chocolate cakes” rounds things out. These are gorgeous creations sure to make your friends drool. 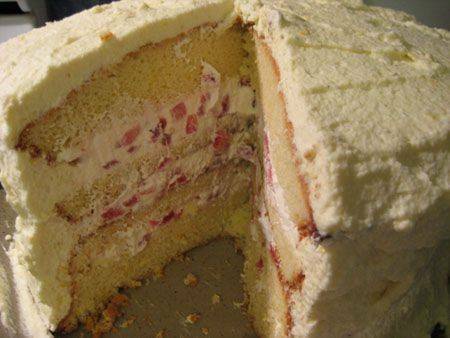 The strawberry, orange, and white chocolate cake is to-die-for. Before you see the photo of our version, below, let me just say that any lack of gorgeousness is due to my own clumsiness, not the fault of the recipe. It tastes amazing—and did I mention we still have some in the fridge? It’s layers of white chocolate cake with orange zest (one neat thing about using white chocolate in cake is that it’s harder than butter at room temp, but melts easily at body temp, so the layers are more structurally sound to work with, but the cake is still incredibly tender in the mouth), filled with strawberry whipped cream, and topped with white chocolate whipped cream. YUM. Okay, hungry now. Ahem, anyway, there are also chocolate Yule logs, raspberry forest cakes, and on and on. I think that chocolate cake is common. But it depends on how you bake the cake. The important is the taste of the cake. Thank you.